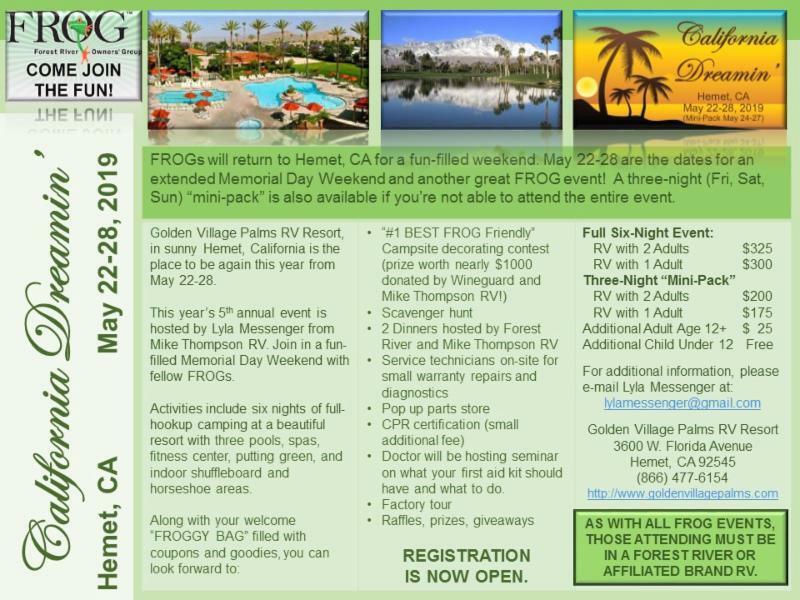 Golden Village Palms RV Resort, in sunny Hemet, California is the place to be again this year from May 22-28. This year’s 5th annual event is hosted by Lyla Messenger from Mike Thompson RV. Join in a fun-filled Memorial Day Weekend with fellow FROGs. Activities include six nights of full-hookup camping at a beautiful resort with three pools, spas, fitness center, putting green, and indoor shuffleboard and horseshoe areas. Doctor will be hosting seminar on what your first aid kit should have and what to do.